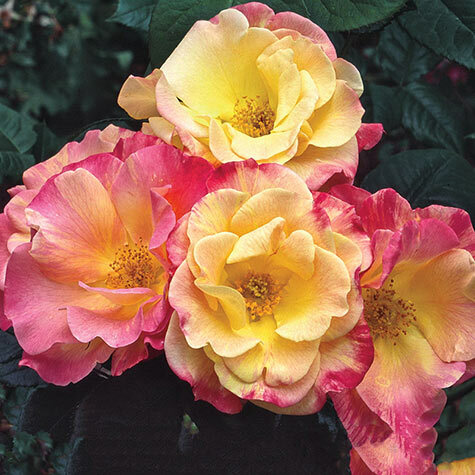 Joseph's Coat Climbing Rose | Gurney's Seed & Nursery Co.
Cardinal red buds have a coral tint, open golden, then gradually turn red again. Climbs 8-10 ft. Zones 4-10. No. 1 to 1 1/2 grade. Color: Red blend of: red, orange, pink, yellow. Flower Form: Blossoms start out red, turns orange, yellow, crimson and gold, recurrent blooms. Soil Requirements: Well-drained, organic, slightly acid soil. 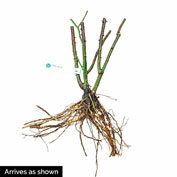 Pruning: Remove spent blossoms to promote reblooming. Remove any weak growth and suckers. Size: 3 - 4 inch blossoms. Comments: For heavy soil, add peat moss, dehydrated cow manure or compost. Mound soil in the center of the hole, spread roots over mound, add 1/2 of the soil, compact the soil, complete filling, compact that soil, and water well. 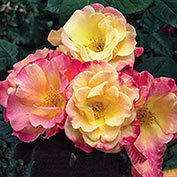 Fertilize once a month with rose food. Water 1 inch per week when rainfall is insufficiient. Spray or dust every week for insects. Mulch heavily around the base for Winter and cover rest of plant with straw or shredded leaves.